If ever there was a film that begged to be celebrated on the big-screen -- heck, that begged viewing with 3D glasses -- it is this one, a sensational ride that throws you, the viewer, into the deep-end and drags you along for a chained and scorched and unbelievable ride, says Raja Sen. Some kids are just better at playing with action figures. You may have the exact same toys, and all kids construct action setpieces while dhishooming at the mouth, but there are some who bring actual artistry to the table as they mesh their Transformers together to form monstrous new ones or catapult their GI Joes alongside speeding plastic train. Even their sound effects are more elaborate, more of a performance, more thought-through, more impressive. You try to up your game and, to an extent, do, but in the end it's best to sit back and marvel at something special, at a dramatically daring imagination. Nobody -- but nobody -- plays with action figures better than George Miller. Before Mad Max: Fury Road, for instance, nobody ever thought of rampaging inbred cultists swooping down on escaping heroes from giant bendy stilts, swinging in like furious upside-down pendulums, or pogo-sticks that, robbed of their bounce, now resemble grasshopper antennae. Now, after the already immortal imprint in our heads of the masterful madness Miller unleashed, it feels like the simplest, most obvious idea in the world: Rubber-band your Iron Man to a drinking straw, kids, because what fun can a chase be without a Polecat or two? Cinema exists to evoke. That is its primary purpose, and Mad Max: Fury Road breathlessly, relentlessly, gloriously takes over our brains as we watch, its blistering narrative so propulsive, so revolutionary, so damned smart that it could rip our eyelids off. It is an audacious concept, a two-hour chase scene, cinema as climax instead of building up to one, and Miller -- through fiery visuals, progressive thought, compelling if barely defined characters, exquisitely elaborate choreography, and lean, brave screenwriting -- evokes a feature-length feeling so few films are able to sustain for more than a few minutes: urgency. This is owed, most greatly, to the film's absolute and inspirational level of clarity. Unlike in most cinema that relies too heavily on computer generated effects, Miller's new film decides to use mostly practical stunt-work, and, this combined with the intricacy of the action setpieces, makes the audience constantly aware of the sprawling epic unfolding on screen. It brings us into the action instead of whizzing past us, and the jaw drops -- both involuntarily and often. It is also a film where exposition and backstory are all but expunged, and this audacious form of storytelling, where filigree-nosed bastards appear and die with nary an explanation of their origins, feels not just refreshing but also, I daresay, realistic. In a situation as frenetic and dire as Mad Max: Fury Road keeps us strapped in, perpetually on the run, verbal introductions and liner notes seem most extraneous: All we need to know is that his limousine is bad news. Mad Max himself, meanwhile, isn't talking too much. Far removed from the loonier, more unpredictable -- more mad, without a doubt -- Max of the original films played by Mel Gibson, the new Max Rockatansky is a surlier, silenter, leading man. But is he at all a leading man? Played by the chameleonic Tom Hardy, this 'hero' spends a large part of this film with his mouth muzzled and stuck in front of a chasing vehicle, like a filthy and oversized hood-ornament. He does what needs to be done, and knows when it's best to leave the last bullet in the hands of someone with better aim. It is Charlize Theron's armless (but not, I assure you, harmless) Imperator Furiosa who is in charge of this film, and -- in a moment that says it all -- tells Max not to breathe so she can use him for a cushion. 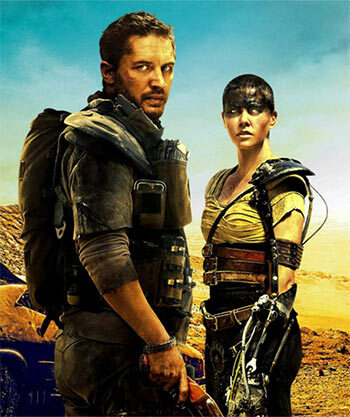 Furiosa works (at least initially) for the dictator Immortan Joe, a Hell's Angel who looks like the burly love-child of Betaal and Ghost Rider, who keeps his masses parched of water, which is called Aqua Cola in this dystopic desert world. The world-building is magnificent and breathtaking, a result of John Seale's masterful cinematography that shows off insane levels of art-directed detail while never compromising on the nightmarish scale of the badlands, and Margaret Sixel's beautiful, berserk editing that, when we least expect, cuts to close-ups of shiny chrome gear-knobs, and away from wide-shots of spiky cars about to explode in a cloud of scarlet and sweat. There is so much detail to gape at, and so lovingly does Miller show it all off, the film oozing originality at every pore. This is a sequel of Miller's own Mad Max films, sure, but you don't need to have seen the old ones (dated but still enjoyable because, mostly, of Gibson) to enjoy this film because it doesn't rely on any baggage. Like Max, this film travels light. Furiosa, on the other hand, doesn't. Her big war rig is packed with five of Joe's 'wives,' lissome and heavenly creatures who, despite their Pirelli calendar worthiness, are a ballsy lot on the run because they don't want to be used. These ladies bring courage and vulnerability and unborn children to the narrative, and the images of these girls ready for revolution are what stick in the mind even more than claw trucks and altars made of steering wheels. This is a film about survivors and enablers, and by the time we get to a famed green place, the narrative is overrun by old biker women with wrinkled faces and sniper-eyesight. Max might make a suggestion or two, as might Nicholas Hoult as a chrome-loving cultie worshipping at the altar of V8 engines, but in this film at least, this film where mother's milk is the ultimate power-drug, Miller's world belongs to the women. Mad Max: Fury Road is a monumental achievement, a triumph of one man's singular and staggering imagination. If ever there was a film that begged to be celebrated on the big-screen -- heck, that begged viewing with 3D glasses -- it is this one, a sensational ride that throws you, the viewer, into the deep-end and drags you along for a chained and scorched and unbelievable ride. For my money, Mad Max: Fury Road is the greatest action movie of all time. And not least because Miller lets his titular hero slink away into the crowd at the end. Kept alive at first merely because of utility -- he is a 'bloodbag' marked a universal donor -- Max has already moved on. As has Miller, the 70-year-old visionary poised to make at least two more movies in the same insane vein. Giving is in their blood. Bipasha, Raveena, Sridevi in song!